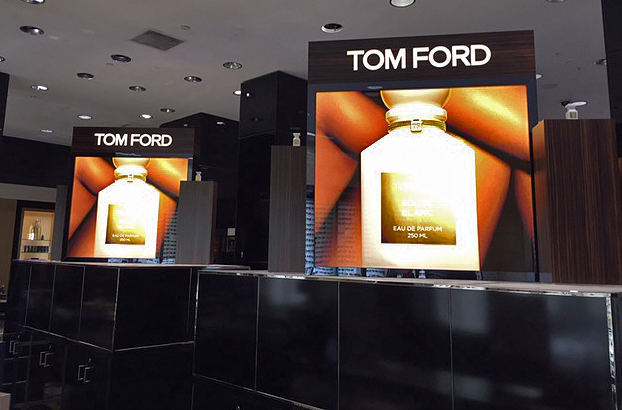 Fabulous Tom Ford — Geoff Howell Studio Inc.
Tom Ford is all about summer and his new fragrance "Soleil Blanc" is no exception. He even used closeups of a model's perfectly tanned skin to provide the perfect shade of golden brown to highlight the fragrance image and name. For our part, we were asked to build and install large black lacquer light-boxes on top of the ledge, the show stopping center piece on "B'way" which showcased large light-box images as well as lit side vitrines with the actual product and satellite displays by the elevator of the Bloomingdale's flagship on Lexington Ave.